There is nothing about the wizened old man with a free-flowing beard that suggests he was a sought-after architect, who’d been a senior town planner in Liverpool, United Kingdom, and later became the chief architect and town planner of Mombasa in Kenya. 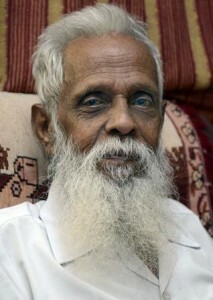 Living as the guest of a family of Sri Lankan Tamils here, 88-year old Solomon Arulanandam David, who arrived in Chennai in 1984 in the wake of ethnic riots in Sri Lanka, has only bitter memories of his homeland, but clings to the hope that one day his people will achieve their political objectives through peaceful and democratic means. He was the founder of ‘Gandhiyam’, an organisation involved in the rehabilitation of riot-hit Tamils from the hill country in Sri Lanka, and was a witness to the Welikade prison riots in 1983 in which 53 Tamils, including early militants Kuttimani, Jagan and Thangadurai, were killed. His friend and co-founder of Gandhiyam, Dr Rajasundaram was also killed. “The Sri Lankan government came to the conclusion that we were training militants in our Gandhiyam training Centre and arrested me and Rajasundaram in 1983. After the riots, I saw a heap of human bodies, some still writhing in pain,” recalls Mr. David. Later he was shifted to Batticaloa prison, but he and 42 other inmates broke out and escaped to India after spending 27 days in the Vanni jungles. “If we had been given three more years, we would have established ‘Ram Rajya’ as Gandhi dreamt. The war would have been avoided. But Sinhala chauvinists wanted to liquidate Tamils and they wiped out Gandhiyam,” Mr. David says. It was while working in Mombasa that he discovered Mahatma Gandhi. “An Indian lawyer’s clerk had collected 9,000 books on India and donated all of them to the Mombasa library. I lived in this library between 4 and 8 p.m. nearly every day. It was there I discovered India and Gandhi who was to play a leading role in my life,” says Mr. David, who studied B. Arch in Melbourne University after winning a scholarship. He worked for the Public Works Department of Sri Lanka for some time before going to England to study town planning in Leeds. He quit a lucrative career to plunge himself into a movement to benefit the people. He said large-scale human casualties could have been avoided if LTTE leader V. Prabhakaran had disbanded his force when he realised that the whole world was united in supporting Sri Lanka in the war. He said the LTTE leader failed to take into consideration the changing geo-political situation and went too far in his attempt to achieve Tamil Eelam. “I have no doubt that it was he who saved Tamils. But I always had reservations about accepting him as a leader of the Tamils. There was a flaw in his personality,” Mr. David argues. With the 25th anniversary of the Indo-Sri Lankan Accord evoking bitter memories, Mr. David feels the only way out for Tamils is to follow Gandhian ideals and democratic means while helping one another on the lines of the community of Aga Khan’s followers across the world. “They meet once a week and take care of the members of the community and the education of their children. Sri Lankan Tamils can do the same. But unfortunately, our people have become selfish and stingy,” he said, reiterating that the transnational government set up by a section of the Tamils could also work effectively for the community’s benefit. Simultaneously, the transnational government could put pressure on the United Nations to bring to book Sri Lankan President Mahinda Rajapaksa for war crimes and the documents of Professor Francis A. Boyle, an American expert on international law, could be used for the purpose, he said.